Most gardeners realize the importance of a hose. Improper use or a hose of poor quality can be annoying and harmful. Does your hose have leaky connections? Is it too short? Is it impossible to roll up? Are the edges of its metal couplings sharp and jagged? If you answered yes to any of these questions, you probably need to make minor repairs or purchase a new hose. Repair is usually easy and inexpensive. If you decide to buy a new hose, it is worth paying more for one of high-quality that will provide excellent service for a long time. A well-made hose is flexible in any weather. This is usually the case with hoses made of high-grade rubber and laminated filament. It is seldom true of the inexpensive plastic models. 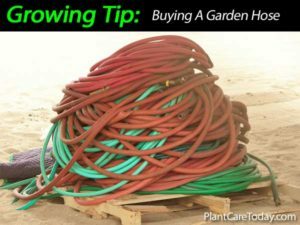 The hose you buy should be long enough to reach to all areas of your yard, and should have a wide enough diameter to supply sufficient quantities of water. The larger the diameter of the hose, The more water it can deliver. Garden hoses are available in three-quarter inch, five eights inch, and 1/2 inch diameters. A hose that is five eights inch in diameter is the usual choice for a medium size lawn. If your hose needs repair, you’ll find a wide variety of hose repair equipment, as either clamp on or screw on connections. Our favorite is the brass screw on type featured in many stores. If you have ever damage plants while dragging the hose from one area to another, consider placing heavy wooden stakes as barriers in key areas of the garden. You will smile as you read it ….. Because as stupid as it may sound, this is exactly what we as consumers do! This is a Humorous Story About Lawns! Frank, … You know all about gardens and nature. What in the world is going on down there on the planet? What happened to the dandelions, violets, milkweeds and stuff I started eons ago? I had a perfect no-maintenance garden plan. Those plants grow in any type of soil, withstand drought and multiply with abandon. The nectar from the long-lasting blossoms attracts butterflies, honey bees and flocks of songbirds. I expected to see a vast garden of colors by now. But, all I see are these green rectangles. This is a General Lawn Mower Information post about lawn mower delivery, safety, operation and maintenance issues. Be sure to always read your lawn mowers manual before operating for the first time. Become familiar with all of the features and the safety issues while operating your lawn mower. If you plan to do your own maintenance, the manual will provide lot’s of tips about this aspect. Make sure that the lawn mower is turned off and that the spark plug wire is disconnected so that there is no danger of the mower starting accidentally. Delivery: Most lawn mowers can be picked up in the store, however if you do not have the means to take it home yourself, delivery usually can be arranged for a delivery charge. Depending on the size of the lawn mower, than handles can be folded down allowing the lawn mower to be placed in your trunk. 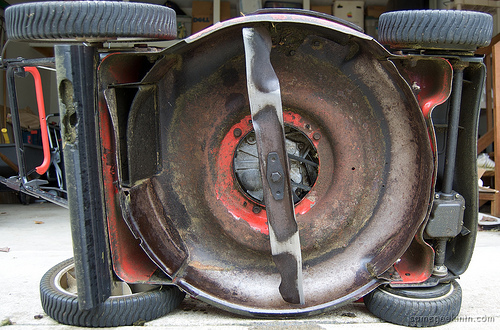 You may want to consider borrowing a trailer or a van to bring home your lawn mower and avoid the delivery charge. Some vendors such as Home Depot, Lowes and others will rent a van to you by the hour to transport items purchased at their stores. The rates are quite reasonable. All lawn mowers should be treated with respect. They are powerful machines and in the wrong hands can do a lot of damage. Start by reading the manual and following all of the safety guidelines outlined in the manual. Never work on the lawn mower without first ensuring that the engine is turned off and the spark plug wire is disconnected. Always check the engine to make sure that there is sufficient oil in the engine before starting each day. Top up if necessary. Fill the fuel tank while the engine is cool. A good time to do this is before you start cutting the lawn. Fuel spills can sometimes cause fires. If you do spill any fuel, wait until it evaporates prior to starting the engine to avoid any chance of fire. Always fill the fuel tank outdoors. Even the fumes can be dangerous. Never smoke around a lawn mower especially if you are filling it with gasoline. The fumes can suddenly ignite causing severe burns and worse. Keep the housing free of debris to avoid the acid from the grass causing the housing to deteriorate. Also keep grass from building up around the muffler to avoid the possibility of fire. This actually happened to our lawn mower when I was not paying attention. Check the spark plug to ensure that it is not corroded and dirty. Replace if it is pitted. Check the gap to make sure it is set to the proper specification. Always use clean fresh gasoline for your lawn mower. Following these tips and others in the manual will ensure that your lawn mower will last for many years. Lawn mower service is something most people do not think about until they use their lawn mowers for the first time in the spring. The spring time is the time of year that lawns are growing. Consumers as well as lawn maintenance companies are preparing their equipment for the coming summer season. It is a good time to perform basic maintenance on their lawn mowers and to make sure they are ready for the coming season. We have included a number of items to include on your lawn mower maintenance checklist. There are also some general guidelines that everyone should consider when doing maintenance on their lawn mowers . Clean the spark plug and re-gap, change the spark plug if required. Never run an engine indoors or in the poorly ventilated area. Engine exhaust contains carbon monoxide, an odorless and deadly gas. 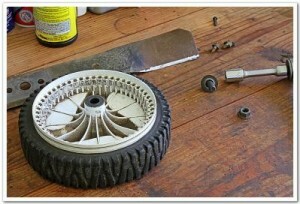 Before cleaning, repairing, or inspecting, make certain the blade and all moving parts have stopped. Disconnect the spark plug wire and ground against the engine to prevent unintended starting. Check the blade and engine mounting bolts at frequent intervals for proper tightness. Also, visually inspect blade for damage. Replace blade with the original equipment and manufacturers blade only. Use of parts which do not meet the original equipment specifications may lead to improper performance and compromise safety! Lawnmower blades are sharp and can cut. Wrap the blade or wear gloves and use extra caution when servicing them. Keep all nuts, bolts, and screws tight to be sure the equipment is in safe working conditions. After striking a foreign object, stop the engine, disconnect the spark plug wire and ground against the engine. Thoroughly inspect the lawn mower for any damage. Repair the damage before starting and operating the lawn mower. Never attempt to make a wheel or cutting height adjustment while the engine is running. Grass catcher components, discharge cover, and trail shields are subject to wear and damage which could expose moving parts or allow objects to be thrown. For safety protection, frequently check components. Replace immediately with original equipment manufactures parts only. Use of parts which do not meet the original equipment specifications may lead to improper performance and compromise safety! Do not change the engine governor setting or over speed the engine. The governor controls the maximum safe operating speed of the engine. Check fuel line, tank, and fittings frequently for cracks or leaks. Replace if necessary. Do not crank engine with spark plug removed. Maintain or replace safety labels, as necessary. Observe proper disposal laws and regulations. The improper disposal of fluids and materials can harm the environment. To avoid serious injury or death, do not modify engine in any way. Tampering with the governor setting can lead to a runaway engine can cause it to operate at unsafe speeds. Never tamper with factory setting of engine governor. To avoid personal injury or property damage use extreme care in handling gasoline. Gasoline is extremely flammable and the vapors are explosive. Serious personal injury can occur when gasoline is spilled on your self or on your clothes which can ignite. Wash your skin and change clothes immediately. Use only an approved gasoline container. Never fill containers inside a vehicle or in a truck or trailer bed with a plastic liner. Always place containers on the ground away from your vehicle before filling. Remove gas powered equipment from the truck or trailer and refuel it on the ground. If this is not possible, then refuel such equipment on a trailer with a portable container, rather than from the gasoline dispenser nozzle. Keep the nozzle in contact with the rim of the fuel tank container opening at all times until filling is complete. Do not use a nozzle block open device. Extinguish all cigarettes, cigars, pipes and other sources of ignition. Never refuel machine indoors because flammable vapors will accumulate in the area. Never remove gas cap or refuel while the engine is hot or running. Allow engine to cool at least two minutes before refueling. Never overfill fuel tank. Fill tank to no more than 1/2 inch below bottom of filler neck to provide for fueled expansion. Replace gasoline cap and tighten securely. If gasoline is spilled, wipe it off the engine and equipment. Move it to another area. Wait five minutes before starting the engine. Never store the machine or fuel container near an open flame, spark or pilot light as on a water heater, space heater, furnace, clothes dryer or other gas appliances. One of the most important parts of your lawn mower, next to the engine is the blade. A sharp well maintained blade will ensure a clean cut on your grass. A clean cut will not only provide a nicer look to your lawn after it is cut, your lawn will be healthier as well. Dull blades tend to tear the blades of grass rather than cut them. Torn blades do not look as nice as sharp ends that have been cut off. They are more susceptible to disease and insects as well which can lead to long term problems with your lawn. Also blades with nicks out of them may become unbalanced and place unnecessary stress on the engine. If your blade as nicks out of the cutting service, you should really replace the blade with a brand new blade specifically designed for your lawn mower. Disconnect spark plug wire from spark plug. The blade may be re-sharpened by removing it and either grinding or filing the cutting edge keeping as close to the original bevel as possible. Do not attempt to sharpen the blade while it is still on the lawn mower. It is extremely important that each cutting edge receive an equal amount of grinding to prevent an unbalanced state. Note: improper blade balance will result in excessive vibration causing eventual damage to the engine and lawn mower. Be sure to carefully balance blade after sharpening. Possible damage resulting from blade unbalance condition is not the responsibility of the manufacture and most will not honor warranties on blades or engines when they are not balanced properly. Note: always removed blade from the adapter for testing balance. The blade can be tested for balance by balancing it on a round shaft screwdriver. Remove metal from the heavy site until it balances evenly. Installing the adapter on the crankshaft with the star away from the engine. Place the blade with the side marked bottom facing away from the adapter. Align the blade bell support over the blade with the tabs in the holes of the blade insert the hex bolt. Tighten the hex bolt to the torque listed in your manual. Above all review your manual that came with your lawn mower. The above guidelines are just that and not specific to any particular lawn mower. If you are uncomfortable or unsure about checking your lawn mowers blade or sharpening the blade, take the lawn mower into your local small engine repair shop for maintenance. You can have the oil changed at the same time and the spark plug checked also. They will charge a nominal fee and ensure that your lawn mower will last another year and run well for you. Some people believe in just using them until they stop, then going to purchase another one, which is a really poor use of a piece of equipment. Additional comments are welcome about lawn mower blade care and sharpening. Spam comments are auto deleted. We decided to post the general operation guidelines that are found in many lawn mower manuals as a handy reference for our readers. The following is a long list guidelines, that everyone should read at least once before operating a lawn mower for the first time. It is also a good refresher for anyone who is purchasing a new lawn mower and may want to brush up on operating guidelines. Read the operator’s manual carefully in its entirety before attempting to assemble your lawnmower. Read, understand, and follow all instructions on the machine and in the manual before operation. Keep this manual in a safe place for future and regular reference and for ordering replacement parts. Be completely familiar with the controls in the proper use of this machine before operating it. Your lawn mower machine is a precision piece of equipment and not a plaything. Therefore, exercise extreme caution at all times. Your lawn mower has been designed to perform one job: to mow grass. Do not use it for any other purpose. Never allow children under 14 years old to operate your lawn mower. Children 14 years old and older should read and understand the instructions in this manual and should be trained and supervised by an adult. Only responsible individuals who are familiar with these rules of safe operation should be allowed to use this machine. Thoroughly inspect the area where the equipment is to be used. Remove all stones, sticks, wire, bones, toys and other foreign objects which could be tripped over or picked up and thrown by the lawn mowers blade. Thrown objects can cause serious personal injury. Avoid discharge of material toward buildings, sidewalks, bystanders and the like to avoid accidents. Also avoid disturbing material against a wall or obstruction which may cause discharge material to ricochet back toward the operator. To assist in avoiding blade contact and thrown object injury, stay in the operators position behind the handles and keep children, bystanders, helpers at least 75 feet from the mower while it is in operation. Stop machine if anyone enters the area. Always wear safety glasses or safety goggles during operation and while performing an adjustment or repair to protect your eyes. Objects which ricochet can cause serious injury to the eyes. Where sturdy rough soled work shoes and close-fitting slacks and shirts. Shirts and pants that cover the arms and legs and steele toe shoes are recommended. Never operate this machine in bare feet, sandals, slippery or lightweight shoes. Do not put hands or feet near rotating parts or under the cutting deck. Contact with the blade can amputate hands and feet. A missing or damaged discharge cover should be in place to avoid blade contact or thrown object injuries. Many injuries occur as a result of the lawn mower being pulled over the foot during falls caused by slipping or tripping. Do not hold onto the handle of the lawn mower if you are falling; Release the handle immediately. Do not operate the lawn mower while under the influence of alcohol or drugs. The control handle is a safety device. Never attempt to bypass its operation. Doing so makes a safety device inoperative and may result in personal injury through contact with the rotating blade. The control handle must operate easily in both directions and automatically return to the disengage position when released. Do not operate the lawn mower in wet grass. Always be sure of your footing. A slip and fall, can cause serious personal injury. If you feel you are losing your footing, release the control handle immediately and the blade will stop rotating within 3 seconds. Stop the blade when crossing gravel drives, walks or roads. If the equipment should start to vibrate abnormally, stop the engine and check immediately for the cause. Vibration is generally a warning of trouble. Shut the engine off and wait until the blade comes to a complete stop before removing the grass catcher or unclogging the chute. The cutting blade continues to rotate for a few seconds after the engine is shut off. Never place any part of the body in the blade area. Make sure that the blade and engine have come to a complete stop. Never operate the lawn mower without a proper trail shield, discharge cover, grass catcher, blade control handle or other safety protective devices in place and working. Never operate a lawn mower with damaged safety devices. Failure to do so, can result in personal injury. Muffler and the engine become hot and can cause burns. Do not touch. Only use parts and accessories made for your machine by the manufacturer. Failure to do so can result in personal injury. Pull chord slowly until resistance is felt. Then pull rapidly. Rapid retraction of starter cord will pull hand and arm toward engine faster than you can let go. Broken bones, fractures, bruises or strains could result. Call customer assistance for the name of your nearest servicing dealer. Read your own lawn mower guide for specific instructions related to your lawn mower. Lawn mowers are machines and like any machine care should be taken at all times when they are being operated. This post is focused on using a lawn mower while cutting the lawn on a slope and steps you should take to protect yourself and others from an accident. They can be very dangerous at all times, however when you are on a slope trying to mow the lawn, the operator is in an awkward position and the lawn mower is also in an awkward position. This can lead to serious accidents if care is not taken. It is easy to slip and fall and the lawn mower can slide backwards if you are going up slope for example. Slopes are a major factor related to slip and fall accidents which can result in severe injury. Operation on slopes requires extra caution and if you feel uneasy on a slope because of the angle or grade, then do not mow it. For your safety, some manuals will come with a slope gauge which you should use to help you decide on whether you should mow the slope before operating this unit on a sloped or hilly area. If the slope is greater than 15°, do not operate your lawn mower on it, since there is a high probability that you will slip and fall. Mow across the face of slopes; never up and down. Exercise extreme caution when changing direction on slopes. this gives you much more control of your footing and also the lawn mower. Watch for holes, ruts, rocks, hidden objects, or bumps which can cause you to slip or trip. Tall grass can hide obstacles. Always be sure of your footing. One slip and fall can cause serious personal injury that may be made worse depending what happens to the lawn mower. If you feel you’re losing your balance, released lawn mower control immediately, which will stop the engine and blade rotating within 3 seconds. Do not mow near drop offs,ditches or embankments, you could lose your footing or balance. Better to use a weed eater than a lawn mower in these conditions. Do not mow slopes greater than 15° as shown on the slope gauge. These slopes are just too sharp to mow the lawn safely. Do not mow on wet grass. Unstable footing could cause slipping. Tragic accidents can occur if the operator is not alert to the presence of children. Children are often attracted to the lawn mower in the mowing activity. They do not understand the dangers. Never assume that children will remain were you last saw them. Keep children away from the mowing area and under the watchful care of a responsible adult other than the operator. Be alert and turn the lawnmower off if the child enters the area. Before and while moving backwards, look behind and down for small children. Use extreme care when approaching blind corners, doorways, shrubs, trees, or other objects that may obscure your vision of a child who may run into the lawn mower. Keep children away from hot or running engines. They can suffer burns from a hot muffler. Never allow children under 14 years old to operate a lawn mower. Children 14 years old and older should read the operation instructions and safety rules in this manual. They should be trained and supervised by a parent. Always prevent people and animals from approaching the lawn mower from the exhaust side or discharge side to avoid being hit by debris from the lawn mower. These are a few simple and straightforward guidelines to help keep you and your family safe. Additional comments and suggestions are more than welcome, especially if they will keep our readers safe. Spam comments are auto deleted. For more information about Lawn mowers, click here. This is all about starting a lawn mower, a push lawn mower that runs on gasoline. Obviously, how to start your individual lawn mower will vary according to the brand and model. Some lawn mowers have a choke that you need to engage, while others need to be primed. On the more expensive models, there will be a key or button to turn or press to start the lawn mower. Consult your instruction book for details about your lawn mower. Always follow all proper safety precautions before starting your lawn mower. They can be found in your lawnmower’s manual. Reading your manual is the first thing you should do when you purchase a new lawn mower. It could save you a lot of trouble and make it more safe for you when using your lawn mower if you practice some of the safety recommendations. Engine Oil – Make sure you have enough engine oil in your mower. Usually there is a cap on top of the mower body, smaller than the gas cap, that says “oil” or something similar. The cap will probably have an oil gauge attached, so check the oil as you would in a car, that is, judge the level of oil on the gauge against the depth of the reservoir (the length of the gauge). Compare the level of oil to the marks on the dip stick. Always perform this check at the beginning of each day that you use the lawn mower. Gasoline – Make sure you have enough gasoline. There should be a clearly labeled cap on the gas tank. If you open it, you should be able to look down into the tank and see the approximate level. Add more (preferably using a funnel) if needed. If you spill some of the fuel, wait until it has evaporated before you start the lawn mower. never fill the gas tank while the engine is running and wait till it cools before filling the tank to avoid the potential of a fire. Prime the Engine – Locate the prime button, usually red or black, a squishy button somewhere on the mower’s body. Push it between 3 and 4 times in order to force the gasoline into the lines. Some models will have a choke, which you need to open and then close once the engine is running. Some of the newer models now have automatic primers and chokes, so you may be able to skip this step. You may need to pull and hold a starting lever (a safety feature). Or the lawnmower will not start no matter what you do. All modern lawn mowers now come with this feature. Position – Brace your arm holding the starting lever, and pull upward on the pull chord, which you should find on top of the mower body. You may have to do this several times before the motor starts up. Will Not Start – If you are still unable to get your mower started, try the lawnmower inspection and troubleshooting steps at How to Repair a Lawnmower. Make sure that there is gasoline in the gas tank and have not flooded the engine. Wait for about five minutes before trying to start it again. While you are waiting visually make sure that the spark plug wire is attached to the spark plug. Also that the safety start is engaged. If it still fails to start, you may have to take to a lawn repair service to have the engine serviced. We suggest that you do this early in the season. Otherwise you may have to wait in line at the repair shop to have your lawn mower tuned up or repaired. For more posts about looking after your lawn and lawn mowers, click here. Many people love the idea of being able to ride on their lawn mower while cutting the lawn, while others prefer to get the exercise of walking behind a lawn mower that is self propelled. If you are really looking for exercise, then a pure push type lawn mower is probably the way to go. Not only do you walk behind the lawn mower you expend extra energy as you push the lawn mower as well. Still it can get quite tedious pushing a heavy lawn mower. Especially when you have a large lawn to cut every week! So what type should you purchase. What criteria should you use to help you narrow down your decision? We are going to focus on type of lawn mower in this post and stay away from manufacturers or various models. Basically we will compare the push type of lawn mower, the self propelled lawn mower and the riding lawn mower. Our criteria are cost to purchase, functionality, area to cut and overall ease of use. You may have others and we would be glad to hear about them, so please leave a comment or suggestion. 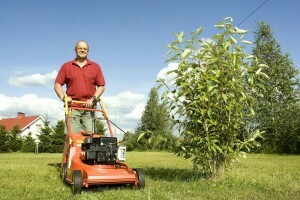 The cost of a lawn mower varies a lot and as you add features the cost goes up. A basic lawn mower with out a grass catcher or mulching capability can cost as low as $150 on sale. This is a push type lawn mower with no features. It has a good engine and will cut your lawn for many years, however you will need to push this lawn mower in all conditions and if the grass is long you may have to rake up the grass. You can spend a little more money can get something with a grass catcher. The next major level up is a self propelled lawn mower and of course these are more expensive, have more moving parts and have more things to go wrong over time driving up repairs. They are easy to drive, you just follow and steer the lawn mower in the direction you want to go. I prefer the front wheel drive model since all you need to do to slow your progress is lift the front wheels a little bit to disengage them from the ground. The rear wheel drive lawn mowers work equally well, however I find these less easy to maneuver. It is not uncommon to spend $400 to $600 on these types of lawn mowers. The next level are riding lawn mowers. There are various types of mowers such as zero turn mowers, and short radius mowers, tractors with mower attachments which can be used for various other activities around the yard. Of course the sky is the limit in terms of size, power and attachments, so the price is as well. You really need to decide what you will use the riding lawn mower for, how much you will use it and whether it is worth it to you to spend up words of $1500 and much more on one of these machines. We have mentioned push, self propelled and riding lawn mowers. What other things do you want the mower to do for you. Mulching, grass catching, de-thatching, roto tilling, pick up leaves, pull trailers, push snow or blow snow. These basic questions and the answers to them will take you in one direction or another in terms of the kind of machine to purchase. The more you want to do with these machines, the higher the cost and the more functionality that is required. Examine this area carefully. Sometimes it is better to buy one machine that will blow snow and cut the lawn with various attachments. Long driveways with large yards in areas were you get hot summers and cold snow winters might push you in the direction of a riding lawn mower with a snow blower attachment. On the other hand, small yards with lots of obstacles and little snow in the winter time pretty well eliminates any kind of riding lawn mower. Riding lawn mowers are naturally bigger, cut larger areas easily and provide comfort for the driver. They do not work as well in areas were there are lots of shrubs to maneuver around, steep grades, and tight corners. If you have any of these conditions, give some careful thought to what you want to purchase and how you will be able to use it. You do not want to end up having to do a lot of extra trimming because you cannot get into tight areas or around shrubs and trees. Riding lawn mowers are best at wide open large areas that need grass cutting. Any of these machines are great to use when the are working fine. The problem is that the more working parts there are the more that can go wrong. Which will drive your overall cost up especially if you need to hire a mechanic to fix the machine. 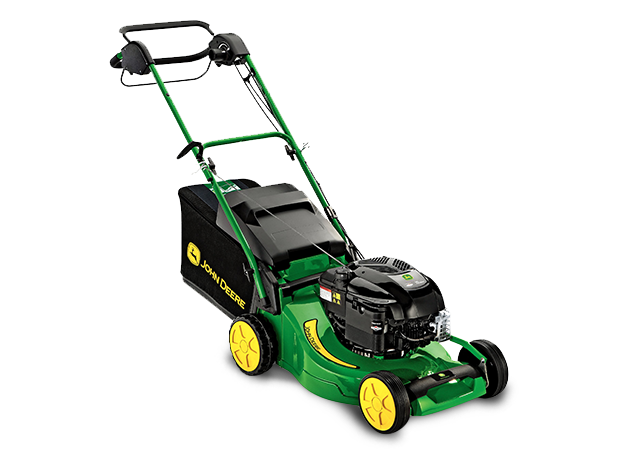 Push lawn mowers just need gas, oil and starting by pulling a chord to get you going. While the other extreme is the riding lawn mower. Which has a starter, a generator, more belts and possibly a transmission and drive shaft. Also inflated tires, larger engine, and several cutting blades. When they work they work great. However like any machine they need regular maintenance. Because they are more complex, your ease of use will be in question if you do have problems. Riding lawn mowers are great, we just want you to realize that these machines are more powerful and will need more care and maintenance than a simple push lawn mower. Feel free to leave comments on our criteria or add some of your own. Spam will be deleted so don’t waste your time and ours. For more details in general about lawn mowers, click here. Summer is around the corner and it is time to tune up our lawn mowers to get them ready for the coming season. Most people wait until the day they need to cut the lawn, only to find out that the lawn mower will not start. A quick decision needs to be made. Do I borrow the neighbors lawn mower, do I take the lawn mower in for repairs or do I buy a new lawn mower and which one do I buy? Most people make quick decisions without all of the information they need. There are several factors that go into the decision and we will discuss them in detail during this post. For the moment we will list them in no particular order of importance. Can you repair your lawn mower yourself? What will it cost to get someone to repair your lawn mower and how much? How much will a new lawn mower cost? What features do I need in a new lawn mower? These are all important issues and depending on the results the cost to you can be quite different! If your lawn mower worked fine last season, chances are that the fuel has gone bad and you will need to clean the spark plug and possibly the carburetor. First of all make sure you actually have gas in the tank. Next remove the spark plug and make sure it is not fouled. Clean it without changing the gap. Re-gap it if you know how to do this. With the spark plug wire attached to the spark plug touch the spark plug to the housing and pull the starter cord to see if there is a spark. If so, your spark plug is fine. Make sure there is no open gas containers around or spilled fuel to avoid a fire. Replace the spark plug, prime the engine one more time and try the engine. If there is gasoline in the tank, then you probably need the carburetor cleaned. If you are comfortable doing this, then proceed otherwise you may have to take the lawn mower to a repair shop for a tune up. Repair shop costs vary all over the place. You could be looking at $50 to $100 for a tune up. Talk to the mechanic first, explain what you need and ask for an estimate. This is where you need to trade off the cost of the repairs vs. purchasing a new lawn mower. Depending on what model of lawn mower you might purchase, the cost of repairs could begin to approach the cost of a new one. Inexpensive push lawn mowers can be purchased quite inexpensively and as long as you are ok with this type of model then your decision is pretty much made for you. On the other hand if your current model has lots of features, cost quite a bit, you may want to reconsider having the repairs completed vs. purchasing another full featured lawn mower. New lawn mowers vary a great deal in price and it really depends on what type of lawn mower you want to purchase. The more features it has the more it will cost. Some inexpensive lawn mowers can be purchased for less than $200, while full featured lawn mowers can cost close to a $1000, with riding lawn mowers going much higher than that. There are a lot to choose from, however some basic decisions will help to narrow done your choices. Push or self propelled lawn mowers are probably the first choice and make a big difference in price. Push mowers are just that, you must push them to cut the grass. Self propelled will propel themselves and all you need to do is steer them. They can be rear or front self propelled. Next you need to decide if you want to mulch your grass, bag it or just spread the grass on the lawn. Many of the higher end lawn mowers will have a 3 in 1 set of options. Which allows you to decide to mulch, bag or discharge your grass clippings depending on the lawn you are cutting. Wider, more powerful and riding lawn mowers are the next class of lawn mower which the majority of consumers do not need unless they have a lot of lawn to cut every week. Most lawn mowers are 21 or 22 inches wide and will more than meet most consumer needs. 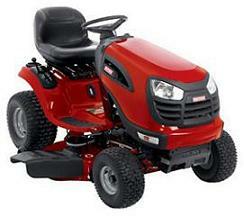 Riding lawn mowers can go from 41 inches up to 55 inches or more and of course the price increases as well. The trade off of course is price vs features vs. what your needs are. Give some thought to what you need and then proceed from there. All of the lawn mowers that we are reviewing are main stream. They will meet your needs for quality and workman ship. It comes down to price, features and also support for warranty and repairs. Make sure that you get the best price with the appropriate support for parts and repairs. Buying a Lawn Mower can be great time saving device. They can also help to protect the environment. If you have a large lawn to mow, you may want to consider a riding lawn mower. While consumers with small lawns or those that want to get lots of exercise, will opt for a push lawn mower. They can be either motorized or non-motorized. Push lawn mowers have the additional benefit of being friendly to the environment. 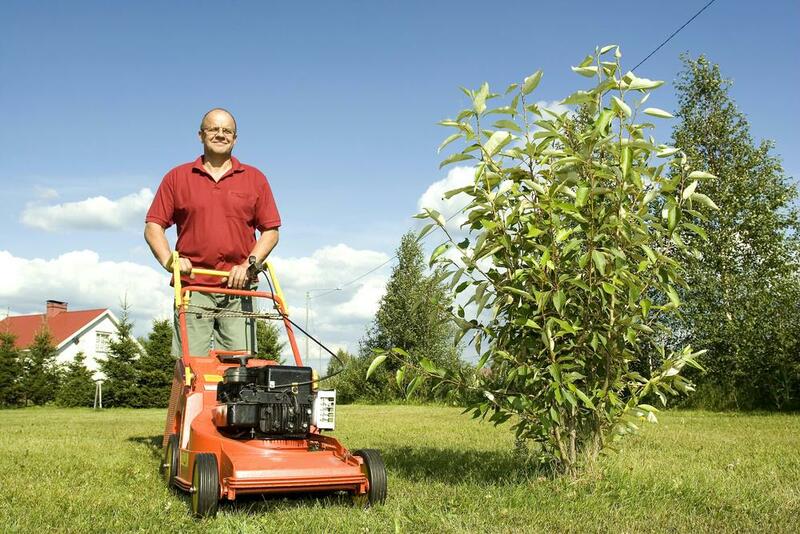 There are number of things to keep in mind when you are buying a lawn mower. Size of your lawn mower vs. the lawn you need to cut. Small lawns are easier to cut with a manual push mower. Large rolling lawns really need to have a self propelled machine to make your life easier. Safety during operation of your lawn mower. Always use the dead man switch when operating the lawn mower. Avoid working on the lawn mower in any fashion while it is still running. Some consumers will ask someone to hold the dead man switch to keep it running while they check the grass catcher etc. This is considered a very dangerous thing to do. Many people are hurt every year this way. Do you need a riding lawn mower, self propelled or push mower? Large lots just take too much time to cut by hand. So many people will opt for a riding lawn mower in these situations even if they are more expensive. Do you need a lawn mower with a grass catcher or a mulching mower? Mulching lawn mowers cut the grass into fine pieces, so that the grass will decay more quickly. A grass catcher needs to be emptied and you need to have somewhere to dispose of the grass clippings. 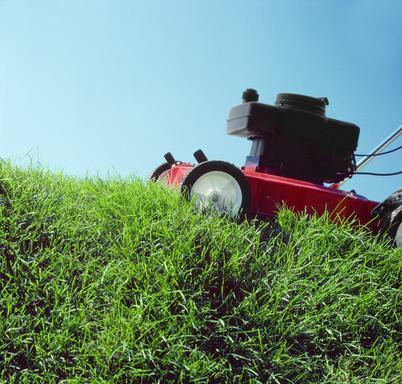 Maintenance of your lawn mower on an annual and monthly basis? Most lawn mowers should have the oil changed once a year as a minimum. Your blade should be sharpened at the same time. Before starting your lawn mower always make sure it is clear of any debris. Make sure there are no fluid spilled anywhere , especially gasoline. Adjustments and repairs to your lawn mower – disconnect the spark plug before doing any repairs yourself. Otherwise find a reasonably priced small engine mechanic to repair your lawn mower. Can you easily find parts for your lawn mower – keep your manual that came with the lawn mower. The part numbers are identified and parts can be obtained more easily from the manufacturer or your local repair shop. 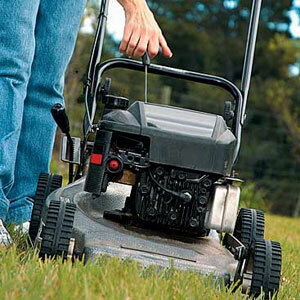 Storage of your lawn mower during off-season – drain the gasoline, make sure there is oil in the crankcase. Clean off any grass and dirt off the housing to keep your lawn mower running for many years. Troubleshooting your lawn mower if it does not operate properly – the manual will have a trouble shooting chart that you can follow. if you are not comfortable doing this sort of work, take it to a small engine repair shop for proper repairs. Safety is paramount when operating your lawn mower to ensure that you or anyone around you is not injured in any way. Always have all guards in place. Never direct the discharge from your lawn mower towards other people or windows. Stop the engine and disconnect the spark plug if you need to remove debris from the lawn mower. Always keep the machine clean and free of oil and gasoline that may be spilled anywhere on your lawn mower. If you do spill gasoline as you are filling your lawn mower, wait until the gasoline has evaporated before trying to start it. This will avoid the possibility of spark igniting the gasoline by accident and causing a much more serious situation. Of course do not smoke around your lawn mower at any time especially when you are filling it.